Click here for here for .pdf copy of narrative. John was born on 14th November 1930 – the same day as Prince Charles (though not the same year!) – in a house called Green Valley, in Park Road, Little Easton; the first house on the right as you go up Park Road. There was a new doctor in the area, and John was the first baby that he delivered in the neighbourhood. John was almost nine years old at the start of the Second World War, and living in Little Easton. He remembers going to Little Easton school with his brother – they used to walk down through the fields. They were coming home from school one day – phone lines being installed for the airfield at what was called Easton Park then; black American soldiers – first they’d ever seen. Their mother had always warned them that once war broke out there would be strange people about, and that they should take care; so they ran for their lives. The soldiers said, ‘Would you like some candy, kids?’, but they were too scared to take it, and just ran for it. Then their mother and father reassured them that they were all right – just American. Easton Park had been beautiful – full of trees, but many of the trees were felled, to make way for the runways they put in, for the airfield. The children from the school used to go up to Easton Lodge – where they had peacocks, monkeys – for tea parties with the Countess of Warwick before the war. The Americans were the first to use the airfield; they had Marauder bombers, two-engined bombers – between 50 and 100 up at the airfield. As young lads, they could hear the planes warming up and they’d go up as near as they could to see them take off and go over to Germany on bombing raids. Then probably three or four hours later they’d hear the droning noise of them coming back, and they’d go up and watch them coming in to land. Some of them would have only one engine out of the two running, where they’d been shot at, or the undercarriage shot away; great difficulty in landing. The Americans were at Easton Park for two or three years. Then when they moved out, the R.A.F. moved in – with Stirling bombers, and gliders. Stirling bombers towed the gliders – for troops; John remembers seeing them flying off to Arnhem. In fact John – and two or three of his mates – nearly went to Arnhem. They used to go up to the airfield, to look at the planes and get as close as they could; the gliders had up and over doors – like a garage door – and they were mucking about near one of them, and got right inside. Looking out, they could see them taking the gliders, connecting them up to the bombers, and got worried that they’d be heading off too. But they managed to prise the door open and get out in time! The children used to have great fun up at the airfield. That was their recreation, going up there and watching the planes going off and coming back in. Security very slack at times! The Americans invited the children in – different from the R.A.F., who posted sentries there to keep people out. With the Americans, they could go where they wanted; they’d have parties up there for the local people, treat them to things – great fun. There was a guard hut – where you now enter the road to Easton Lodge Gardens, just past the entrance to Laundry Lane. John got locked up in the guard room there one Christmas night. This was in 1944, and this was what happened. He was fourteen years old at this time, and living with his family at Raven’s Farm, Little Easton. The R.A.F. were in residence at the airfield, and there were also WAAFs there [members of the Women’s Auxillary Air Force – founded in 1939]. A lot of the airmen and the WAAFs would cycle across the fields and into Dunmow past their house. There was a young WAAF called Ivy, who got a puncture near their house one day. John’s father mended the puncture for her, while she went on to Dunmow, and the family became quite friendly with Ivy after that; she often used to call in for a cup of tea with them. Coming up to Christmas time, John’s mother asked her what she was planning for it – whether she was able to go home to her parents for Christmas. Ivy had 48 hours leave, but lived way up north somewhere so wouldn’t have time to get there. She told them that there were three or four other WAAFs in her billet, and they were going to have a few drinks and a party at the airfield. So John’s mother said, ‘Come to us for Christmas Day.’ So Ivy came to spend Christmas Day with John’s family. Around 11.15 on Christmas night, Ivy said she’d best go, as she had to be back in her billet before midnight. It was a wild night, raining and very dark, and John’s father said to him, ‘You’re fourteen now, boy – you can see Ivy back to her billet’. So, away they went, John said. They got to the gate, and the guard hut, and the guards called out: ‘Halt, who goes there?’ So she gave her name and number, and told them ‘This young man’s just seeing me safely back to my billet.’ So on they went, to her billet. When Ivy knocked on the door, the other three young women saw that she had a young man with her – and insisted Ivy brought him in for a drink with them all. It was gone twelve when John got back to the guard post, and the guard had changed; there were two different guards on duty. ‘Halt who goes there?’ they called. So John explained that he’d just escorted a WAAF back home – gave her name and number – but they didn’t believe him; ‘A young whippersnapper like you?’ one of them said. So he got on his phone, and rang to the guard-room, and out came a jeep; they bundled John into the jeep, and took him off to the guard-room. They then sent the jeep down to Ivy’s billet, and brought her up to the guard-room to verify John’s story. So Ivy explained the situation, and they took John back to the guard-hut by the main gate and sent him on his way. It was about two-o-clock in the morning by the time John got back home; his mother had gone to bed, but his father was waiting up for him. ‘Where the hell’ve you been?’ he said. ‘Have you been up to mischief with that young lady?’ So John said, ‘I’ve been locked in the guard-house’. But he wasn’t altogether sure that his father believed him. A fortnight went by, and Ivy didn’t come by on her bicycle any more. This convinced John’s father that he must have been up to mischief! But after another week had passed, Ivy did call in to see them; she’d been confined to barracks for three weeks – they wouldn’t let her go off the airfield. John was all right after that; his mother and father had heard the story from Ivy too. Rationing; minimum supplies, wasn’t very much at all. 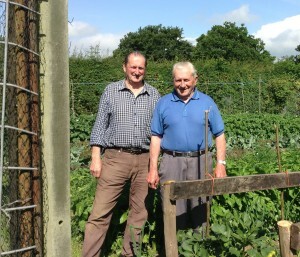 They survived though; used to go out catching rabbits, and John’s father used to grow vegetables – John would help too. Living near the airfield, there were often sirens – and raids. They had to dig a little shelter near their house – at the bottom of the garden; they dug a deep trench, then put galvanised sheeting all round it. Around one or two-o-clock in the morning the siren would go off, and they’d run down – in their pyjamas and all – down to the trench at the bottom of the garden. They did this on several occasions, then John’s mother said they’d had enough; they’d stay in the house instead of running down the garden. Nobody knew what to expect at the beginning of the war, and people panicked; but they became used to it, and made their own decisions. There were five of them heading to the shelter at the bottom of the garden: John’s parents, his brother Jeffrey (three years younger than John, who was the oldest, and another brother, Peter). Peter Perry was very young during the war (born 1938), but remembers the black-out; there were black blinds at all the windows – roller blinds that had to be pulled down – so that no light shone out at night. The Home Guard would come and bang on the doors if any light showed. Though there was no electricity at the time, John said; just paraffin lamps. Peter remembers how dark it was – no lights at all anywhere; pitch black at night. John remembers the plane crashes – at the airfield, and in the area – and bombs falling; on the football pitch. There were three marquees – large tents – up there on the Park, for three or four days. Then they were taken away – moved off – but a couple of days afterwards bombs were dropped on the places where each of the tents had been. Several planes crashed; John’s father went to one, and John went along too sometimes. One Sunday, there was one that crashed just down the road from their house. It was about midday, and his father went along to help; the pilot was in there, and they pulled him out, but he’d burnt to death. There were many crashes; damaged planes flying back to the airfield. Their house was hit too. They used to store the bombs up on the airfield; the Americans. And something went wrong up there – there was an explosion. John was at school, in Dunmow, then; came home from school, and his mother said they’d been hit. The bombs at the airfield had exploded, and there was shrapnel everywhere – and some had hit the house. John thinks there might still be some in his shed somewhere; they kept some of the bits they collected at the time. John went to primary school in Little Easton, and then on to secondary school in Dunmow. He remembers the many evacuees who came to the area; no end of them! One or two still living in the villages now – stayed on after the war; Barbara Staines, for example, and Shirley Collier. Little Easton school was in the village – the house (right hand side) just past The Stag and the bus stop. Children went there until the age of eleven, then on to school in Dunmow. No transport then; had either to walk or cycle – no buses or mini-buses like now! The bombs – that exploded – were stored on what is today part of the sand and gravel extraction site on the old airfield. Years after the explosion, they were working on that part of the land – clearing it for farmland, with big excavators and all – and they came across an unexploded bomb. Experts came to examine it, and it was decided that it was too dangerous to explode it on the spot – although John, Peter and those who’d found it had been handling it since it had been discovered. All the land around the old bomb store was cultivated; John said he’d be working with the tractor, driving along, and would hit something solid from time to time. He’d be waiting for the bang, but luckily none ever came. There were also the remains of planes scattered about the site, at Easton Park; planes that had got shot up, and just made it back. They just piled them up at the time; no end of them. John James Perry’s name is on the Little Easton War Memorial. Many local girls married American soldiers during the war; some went off to America afterwards. Also had German prisoners of war coming to work on the farm. They used to help with the harvest and the potato picking. John got on well with them. The German POWs were housed at Colchester; there’d be about twenty of them coming out to work on the farms, with an armed guard to check they didn’t run off. Mostly very hard workers, John remembers. They could speak enough English that they could communicate. When they had the binder going, and were cutting the corn, there’d be pheasants flushed out. The Germans would say to him: ‘Charlie, where are the chickens?’ – meaning the pheasants – and they’d grab a pheasant running out of the corn, and to kill it they’d just take a knife and cut its head off. Everybody walked and cycled everywhere; very few cars or other vehicles. The air forces had jeeps and lorries, going to and from the airfield. John was in Little Easton choir, and they used to come out from Sunday service about twelve-o-clock, then go up to the airfield. They used to get into the planes – when the Americans were there – and they all got caught one day. They were taken off to the guard room, and one young lad started crying that he wanted his mum; the guards just took them back to the main gate and told them to clear off. No security when the Americans were there, and treated the children kindly. Great celebrations when the war ended. Almost everyone in the village out celebrating on V.E. Day, all the pubs open and a gathering on the Recreation Ground. John cycled down to join in the celebrations; somebody asked to borrow his bike, as there was a girl in the next village he wanted to see. Last he saw of the bike that day.